They’re only available for roughly six weeks a year. Late March to mid-May. This year they were a tad late on account of the odd winter weather we’ve been having. It snowed on Wednesday. In April. Together with fiddlehead ferns, rhubarb, peas and asparagus, ramps are one of the definitive signs that spring has finally arrived. I can’t wait for this weekend. I’ll probably get a couple of pounds. 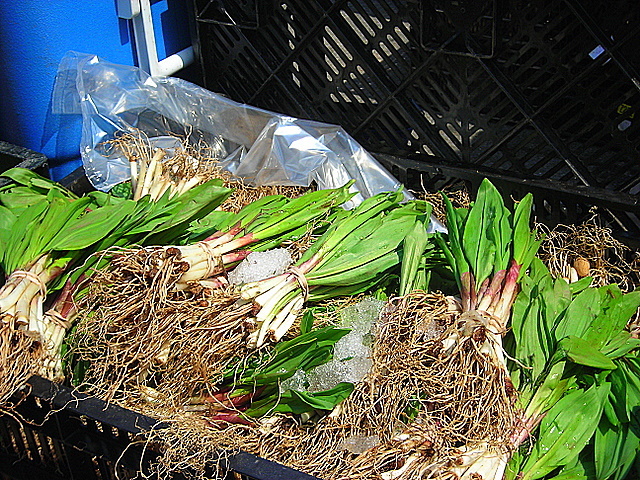 Ramps smell like bear piss mixed with wild onions and mothballed socks. The smell is tolerable though. When cooked, their wildness gives way to a mellow sweetness. I’m looking forward to ramp omelettes, ramp quiche, ramps and asparagus, ramps with bacon, ramps and cornbread, maybe some blini. 10 Apr	This entry was published on April 10, 2009 at 12:01 am and is filed under food, general, vegetarian. Bookmark the permalink. Follow any comments here with the RSS feed for this post. THAT is a NEW name to me: RAMP. I MUST ask our own farmer/grower what he knows about them….. we LOVE the Allium FAMILY, so this should be worth looking up. AS ALWAYS, your Posts ALMOST tempt us to give up being a carnivore. I’m not a vegetarian (I do eat meat and if you take a look around, there are pix of pastrami, bacon, pork belly, chicken, beef, fish and so forth). but lately I’ve been on a vegetarian kick. maybe re-reading Homer has something to do with it. I got a pound and a half last week for $30. Enough for two weeks and well worth the expense.